Jackie O'Regan is the curator at Evergreen House, once the home of arts patron Alice Garrett. Laure Drogoul's sculpture The Root (Blue-Eyed) is part of Sculpture at Evergreen, an exhibition of 10 site-specific outdoor sculptures, on display until September 26. Q: What Would Alice Garrett Think? A: "I don't know what Alice Garrett would have made of Laure Drogoul's sculpture. But in a way, it doesn't really matter. When she was on an accessions committee at the Baltimore Museum of Art, a piece of contemporary art — something abstract — came up for accession, and she said, 'I don't particularly like it, but I will support it.' She had the utmost respect for artists and wanted to support them in every possible way. That's the legacy we try to carry on here. "We asked the artists to respond to some aspect of this place, whether it's the 26 acres of gardens or the house's collections. Laure's big head was taken directly from Evergreen's collection of Japanese decorative arts — the Japanese lacquer, netsuke, and inro collections. She studied the collection and designed her own gigantic netsuke — a mask netsuke from Japanese theater. She wanted it to look like it fell out of the tree. The inside of the head is like an apothecary's inro — a very small compartmentalized purse worn on the belt of a kimono — which she's filled with herbs, medicines, and plantings. "Laure is an artist who sees a connection in just about everything she does. The head is a devil, which is, of course, a symbol of evil. But she's also pasted all kinds of maps — from Baltimore to the Middle East — to the head, and hovering above the map surfaces are images of snakes, garden flowers, and large, menacing flies. She wants people to make visual connections. She wants to make references — to war, to the 'blue-eyed devil' — and to make people think. 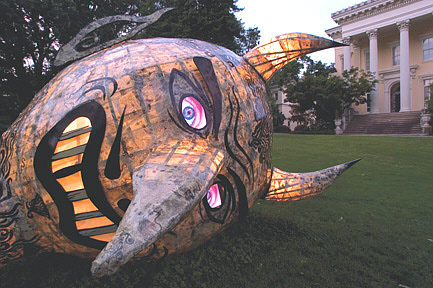 Her sculpture is a visual checklist connecting world events, art, culture, and theater. "Laure is not unlike Alice Garrett. She runs a performance-art venue called the 14K Cabaret, so she's an entertainer, she brings people together, and she supports many different kinds of artists by inviting them to perform. It's a much later generation, but there is a kind of progressive spirit that connects them."